Are you a beginner ? Do you want to play classical guitar ? Here are some usefull tips, hints, secrets and exercices suggested by Daniele Magli. The right hand is marked as thumb=p, index=i, medium finger=m, ring finger=a, remember that it is better not to use your little finger because of shifting your posture. Refere to Right Hand page . 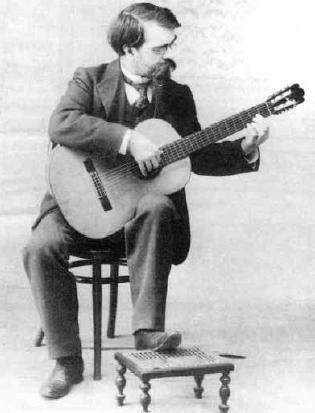 Playing classical guitar, as playing any other music instrument, is not a natural task, it's a 'must learn' technique and it needs a really high training level. The correct basic posture is the 'not at work' posture: sitting on a not too bended chair, without leaning against the backrest, holding an upright back to help a good breathing. Approaching the head stock to the left shoulder we reduce at the minimum the left arms mouvements towards the outside. This mouvements are bad because they increase the hard work and they are so difficoult to manage. People who set the guitar too tilted or parallel to the floor will face more fatigue for the left arm and a lot of problems when unfolding the wrist. Tarrega posture is considered to be a wrong one because it's really tiring and you'll have to practice for a lot time in addition and just to obtain a lower quality. During the first half of the 1800 Matteo Carcassi played a really more usefull posture for the left arm (even though his right hand posture is not so correct because he seems to point his little finger upon the body). Go on practice that untill you'll be able to repeat it for ten times without making any mistakes. This will grant you a lot of control on your right hand. your little finger no.4 on the 8th fret without releasing your no.2. Keep on practice it on every string. We will add new exercices as soon as possible... good work ! 'Twilight' composed by Daniele Magli is an easy arpeggio to learn the fingerboard. Please download the free .pdf score and follow the video. 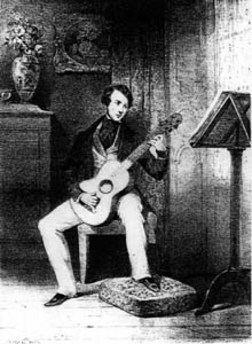 Here are some videos from Youtube collection where you will find a lot of important hints from the greates classical guitarists so you can take a look at the right hands posture and their style. As the strings get old, sound quality will gradually decrease, and it will become difficult to tune the instrument. Change the strings as soon as you think they are getting old. Make sure you purchase a set of nylon guitar strings. 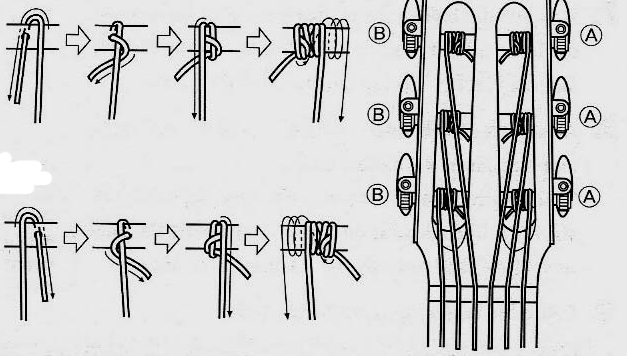 1) Thread the string through the corresponding string hole on the bridge, then tie the string as shown in the illustration below. After tying the knot, pull both ends of the string to make the knot firm on the bridge. Make sure the last knot is positioned over the edge of the bridge. If the string slips (1st, 2nd, 3rd strings) tie one more knot. 2) Next, tie the strings to the pegs. Hold the guitar so the head is facing you and wind the strings onto the pegs as shown in the illustration below. Make the first wind to the left of the hole, and the remaining winds to the right. Make the first wind to the right of the hole, and the remaining winds to the left.